Tip: Get a quick overview of the COMSOL Server™ product in this PDF containing answers to frequently asked questions. 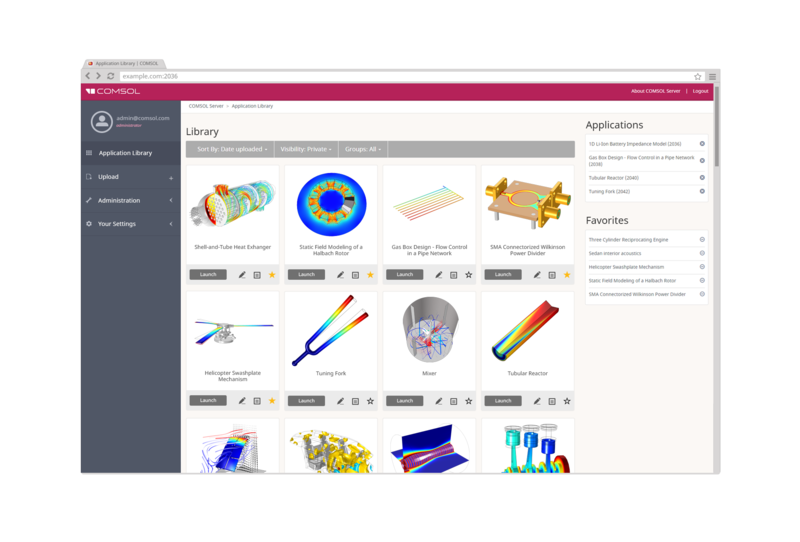 The dashboard and Application Library in the COMSOL Server™ web interface. From the app icon, you can launch an application, make it one of your favorites, and edit permissions. The dashboard also lets you view the apps that are already running as well as monitor CPU and memory usage. The COMSOL Server™ Monitor tool allows you to observe and control hardware usage and who is running an application. Here, you can monitor the CPU and memory usage on your system and also forcibly close down sessions. Example of an app for optimizing the length of a tuning fork as run from a web browser. The app will enable you to change the length and radius of the tuning fork's prongs and will then calculate the frequency and play the sound that these dimensions result in. 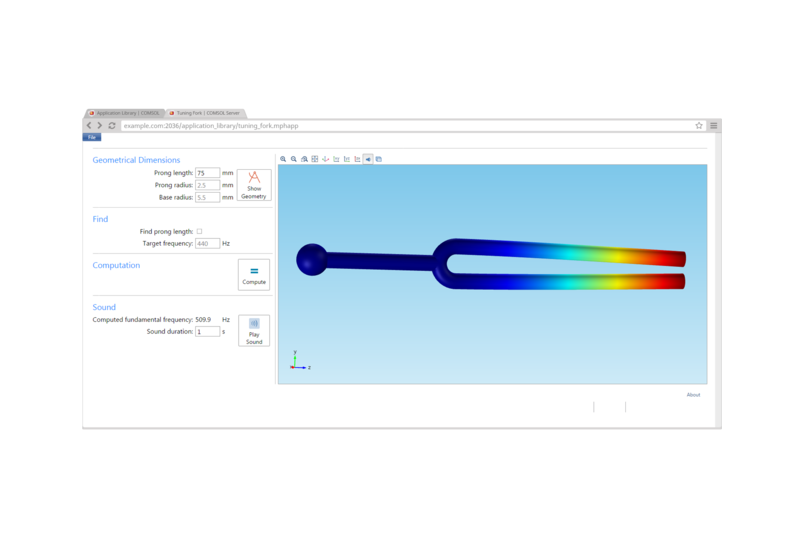 Alternatively, you can calculate the optimal dimensions for a tuning fork by specifying the target frequency. 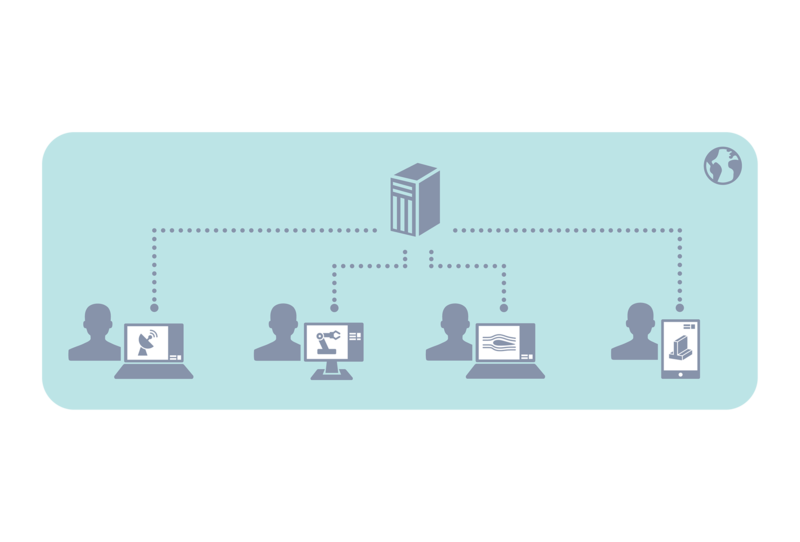 COMSOL Server™ can easily be deployed on your organization's network and be used by engineers, lab technicians, operators, and any other colleague. All COMSOL Server™ licenses are floating licenses. Anyone with the permissions you provide can access an available concurrent seat to run up to four sessions at a time. 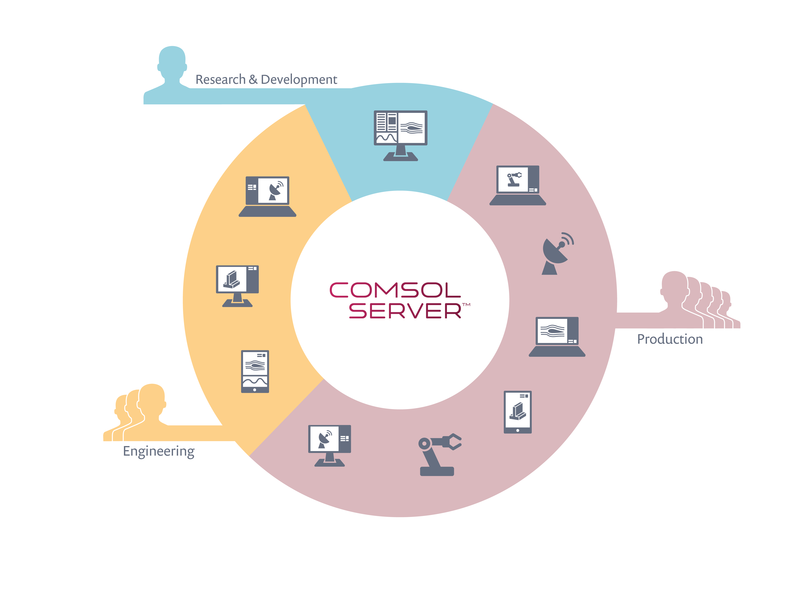 The COMSOL Server™ worldwide license allows great access for many different people to perform simulations. COMSOL Server™ can be accessed and your apps can be run on a locally hosted license by your colleagues in your office, in other offices in other locations, countries, and continents. Furthermore, you can open up usage of a COMSOL Server™ license to colleagues, clients, and customers outside your organization. To achieve this, they can access your license and processors that are being hosted locally or you can install and manage usage of your license from a Virtual Private Cloud and provide your apps and services to customers through this medium. The Academic Server License provides students, researchers, and faculty from other academic institutions with access your institution's license so they can run your apps. Spread your research with the power of interactive simulation. The Application Builder allows the expert to create applications and deploy them throughout their organization. This can be within the engineering or manufacturing departments. The Application Builder in COMSOL Multiphysics® is the revolutionary tool that augments an organization's simulation, design, and manufacturing workflow. 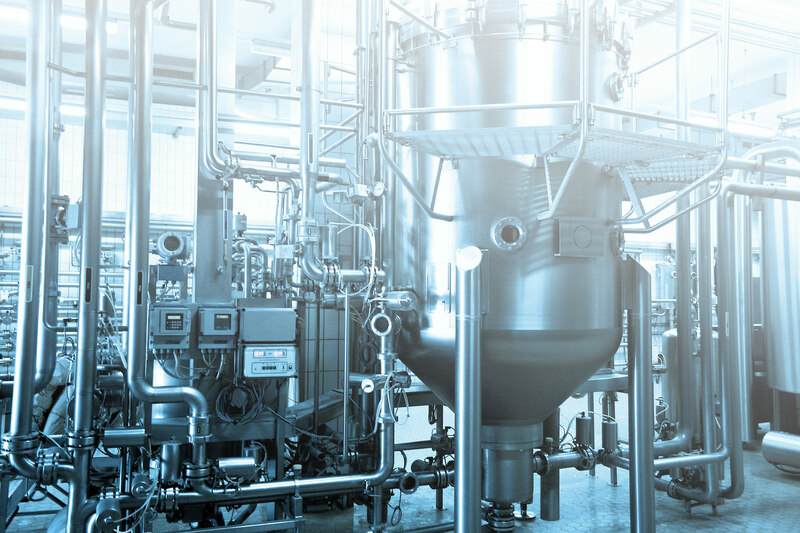 It allows engineering and scientific experts in their industry to create easy-to-use applications based on their simulations. The expert brings theoretical knowledge and the power of simulation to the optimization of a process or design. Other stakeholders can then bring their own experiences of building or operating these processes and designs to the overall workflow by using the related apps. COMSOL Server™ provides the hub that allows you to control the management and running of many different apps over multiple functions or operations in your organization. COMSOL Server™ consists of a web interface that administrates both your organization's apps and who can access and run them. 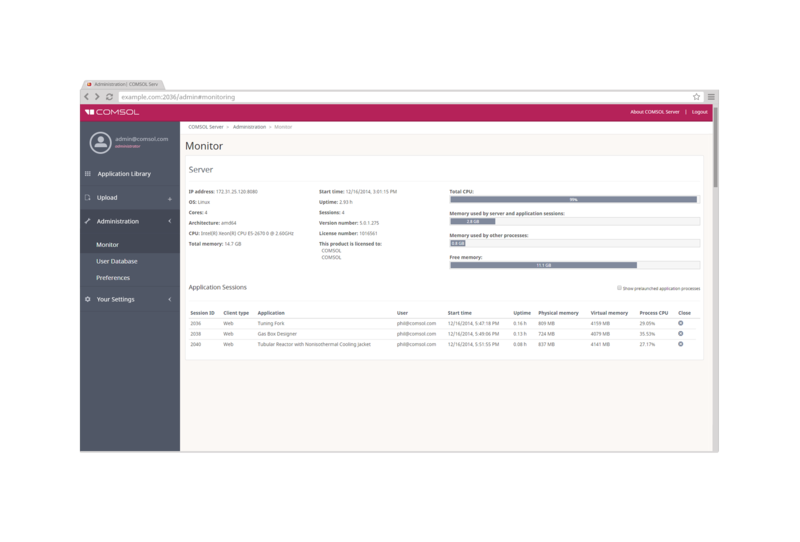 The main dashboard presents your organization's available apps in the Application Library in an easy-to-digest format from where apps can be easily launched and their permissions controlled. Different menu items on the dashboard lead you to interfaces for monitoring your CPU and memory usage and control your sessions running apps. 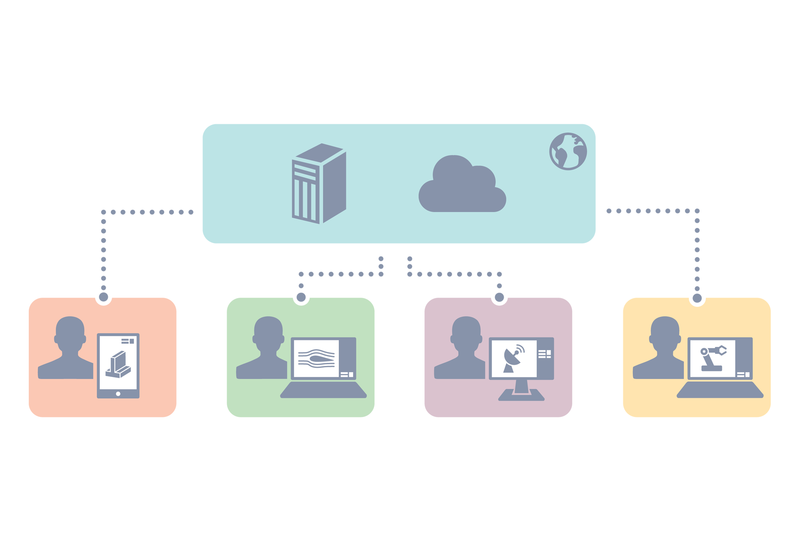 User accounts and groups can be created and controlled, either on-the-fly or by being linked to preexisting user databases on your network. Permissions can be set from the level of administrators who control user groups and processor access to users who can upload and edit apps to those who may only run the apps. Your apps can be run through any popular web browser, such as Google Chrome™, Firefox®, Internet Explorer®, and Safari®, without requiring plug-ins. This utilizes WebGL, an emerging industry standard for interactive 3D and 2D graphics in web browsers. Alternatively, apps can be run natively in the Windows® operating system using COMSOL® Client for Windows®. This can be downloaded from the download page (requires a COMSOL Access account), and it provides better rendering performance compared to running apps via a web browser, while also allowing you to include ribbons in your app interfaces. Further, any app that was created using any of the LiveLink for CAD programs requires this client in order to run. While the Application Builder requires the Windows® version of COMSOL Multiphysics® to build applications, COMSOL Server™ can run applications on Windows®, Linux®, and Macintosh® platforms. It can be embedded into machines and equipment that support these operating systems. Since you are controlling the access and use of applications through a centralized hub, changes and updates to them are immediately made available to all users. 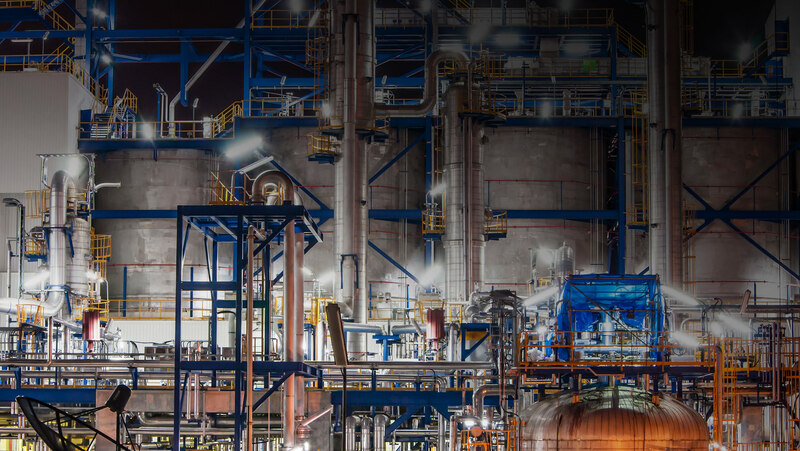 COMSOL Server™ incorporates favorable licensing to allow maximum and flexible use. Once you have installed COMSOL Server™, you decide who can access and run applications on it. This can include multiple users within your organization or, if you wish, your vendors, clients, partners, or customers outside your organization. You can grant them access to your apps and allow them to run the apps on your COMSOL Server™ license from anywhere in the world. You can even host your license on a Virtual Private Cloud (VPC) and use this service to help you request payment for use of your apps and license of COMSOL Server™. COMSOL continues to support academic research through the use of simulation. We consider applications made by students, researchers, and faculty to be publications for the academic world, much in the same way papers, articles, and the like are published by universities and journals. An app provides a more sophisticated presentation of a simulation model than merely placing figures and graphs into an article – and we believe it should be made available to your colleagues. This includes allowing them to view and run your apps on your institution's Academic Server License, even if they do not belong to your institution. If an application has been created using one or more of the physics interfaces or other features that come with any of the COMSOL Multiphysics® add-on products, then the app can only be run on a version of COMSOL Server™ that has licensed the equivalent add-on products. You may also run up to four app sessions per concurrent user. Applications may be run on multiple cores and clusters, if the size of the application requires large amounts of memory, or a large number of parameters must be swept or optimized.